This post is a little bit of fun. There are so many interesting author stories out there I thought I’d delve into the 11 day disappearance of crime novelist, Agatha Christie. For those of you haven’t heard this before I hope you find it as intriguing as I do and for those of you who have heard it then –sorry. It was a cold December night in 1926 when Agatha Christie kissed her daughter goodnight and stated she was going for a drive in her Morris Cowley. The following morning the car was found abandoned, by a lake with the hood up, inside, were her fur coat and a small suitcase. Mrs Christie’s disappearance became the hot topic around dinner tables, bus stops and even parliament. Theories where coming left and right, some pointed to foul play at the hands of her unfaithful husband others at publicity stunt. If it happened to a crime writer today I would definitely say publicity. 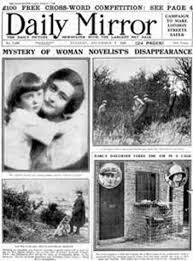 Her disappearance had fellow writers Sir Arthur Conan Doyle (Sherlock Holmes) and Dorothy L. Sayers (Lord Peter Wimsey) on the hunt. Sir Conan Doyle even consulting a psychic. 15,00 volunteers and 500 police scoured the land, waterways and searched by air. Mrs Christie was found 11 days later, at a spa Hotel in Harrogate, when a musician at the hotel recognized her. She had been staying there under an assumed name (more on this in a minute) since the day after her disappearance. This created more speculation as Mrs Christie claimed she had lost her memory. This may be the case, as she was under a lot of stress at the time. Her mother had recently died and her husband was leaving her for his mistress. Prior to the night of her disappearance Agatha had told friends that she was going to take a break in Yorkshire (which happens to be where the Hydropathic Hotel is located). On the night of her disappearance though Archie Christie (Agatha’s husband) had already left to go to a friend’s house to meet up with his mistress miss Nancy Neele. This is the curious part, the name Agatha used to check into the hotel was Teresa Neele. Doctors diagnosed amnesia, but journalists (suspicious bunch they are) and police weren’t convinced. Mrs Christie had plenty of money on her person and it appears to be a highly unlikely coincidence that she would choose to register under her husband’s mistress’ last name. Over the years expert have come forward claiming, evidence of a nervous breakdown and a stress induced condition known as “Fugue “ state (stress amnesia) in 1999 author Jared Cade interviewed Agatha’s brother- in –law who pronounced that Agatha created the hoax to spite her adulterous husband Archie. Whatever the real reason she sure created a stir. The today the Hydropathic Hotel in Harrogate is known as The Old Swan and is now the fitting meeting place for the annual crime writing festival. Imagine if a famous writer did that today, it makes my head spin. “The Murder of Roger Ackroyd” changed my entire view of how stories could be told. When I read it at fourteen, I felt like I’d had an explosion of understanding in my head. I’ve loved Agatha Christie ever since. Her disappearance and reappearance has been something that I’ve often thought over. I love how carefully and fully you’ve written it up here. I’ve always wondered how it felt for her to play, even for a little while, a character out of one of her own stories. Yes, I think she might have secretly enjoyed setting up the scene. Oh yes, she met the Doctor by the lake and was travelling in the Tardis for eleven days. Yes, and then went dancing with The Doctor. Great post! As a huge Christie fan, I’m familiar with it, but have still never been able to decide whether she did it out of spite or whether she really lost her memory. Have you seen the film about the story? If memory serves correctly it was just called ‘Agatha’. It would’ve have been interesting from a writers point of view. Very intriguing. Great stuff. I knew she’d disappeared but not when or how she was found. Did you know she was also a pioneer in the sport of surfing and owned one of the first surf boards. She must have been an interesting person. Wow, that is so interesting. I’m trying to picture her on a surfboard -interesting is an understatement. She wore a 1950s costume, more like today’s short wetsuits if my memory of the photo serves me correctly. She must have been inspirational to a lot of young women.